a new world that was Greek, and great. and in Media, and in Persia, and all the others. with the nuanced policy of judicious integration. which we've taken as far as Bactria, as far as the Indians. "Part of Bactria lies beside Aria toward the north, but most of it lies above and to the east of Aria. It is large and all-productive except for oil. Because of the excellence of the land, the Greeks who rebelled there grew so powerful that they conquered both Ariana and India as well, according to Apollodorus of Artemita. And so they subdued more peoples than Alexander-especially Menander if indeed he crossed the Hypanis River toward the east and advanced as far as the Imaus, for some were subdued by Menander himself, and some by Demetrios the son of Euthydemos, the king of Bactria. They took over not only Patalene but also the rest of the coast, which is called the Kingdom of Saraostos and Sigerdia. In sum, Apollodorus says that Bactria is the jewel of all Ariana; moreover, the Greeks of Bactria extended their empire as far as the Seres and Phryni,""that most prosperous Bactrian empire of the thousand cities." The campaigns of Alexander the Great brought the Greek language and Greek rule to large territories of Central Asia and northwestern India. Cavafy's narrator in "In 200 B.C." uses Bactria and India to indicate the very ends of the earth, the farthest extent of the Hellenistic oikoumenē, the inhabited-for which read "Hellenized and civilized"-world. But Bactria has undergone something of a scholarly rehabilitation from the reputation it once held as the "Siberia of the Hellenistic world." Part of this rehabilitation is due to our better understanding of the political and economic ties that bound it to the world of the Near East. Although geographically distant from the centers of the various Near Eastern empires that asserted control over it (the Achaemenid Persian empire, and later the empire of Alexander the Great and his Seleucid successors), Bactria was neither economically nor politically peripheral. It possessed considerable natural resources and occupied a strategic position between the world of Iran and Mesopotamia and the world of the Eurasian steppe. The resources that made Bactria attractive to the Persians and then to the Greeks also meant that it could be used as a power base, whether as a springboard for a satrap's imperial ambitions or for the secession of an independent regional state. In addition to its agricultural potential with irrigation, Bactria and its southern neighbor Arachosia were sources of manpower. Because of their geographical position, these territories also served as conduits for military forces and war elephants from northwestern India, which might serve under the command of the satraps of Bactria and Arachosia. The region continued to be a source of elephants for the rulers of the Seleucid empire as and when they were able to assert some authority there. In 305 B.C.E., Seleukos I received five hundred elephants under the provisions of a treaty with the Indian emperor Chandragupta Maurya but lost control of Arachosia under this same accord. A Babylonian astronomical diary records the satrap of Bactria supplying war elephants to the Seleucid king in 274/3 B.C.E. In the last decade of the third century B.C.E., Antiochos III conducted an extensive eastern campaign in which he, in the end, made little in the way of territorial acquisitions but did acquire elephants-one hundred and fifty in total-from both the Graeco-Bactrian king Euthydemos and the Indian king Sophagasenos, who ruled in the Kabul Valley. In the aftermath of Alexander the Great’s conquests in the late fourth century B.C., Greek garrisons and settlements were established across Central Asia, through Bactria (modern-day Afghanistan) and into India. Over the next three hundred years, these settlements evolved into multiethnic, multilingual communities as much Greek as they were indigenous. To explore the lives and identities of the inhabitants of the Graeco-Bactrian and Indo-Greek kingdoms, Rachel Mairs marshals a variety of evidence, from archaeology, to coins, to documentary and historical texts. Looking particularly at the great city of Ai Khanoum, the only extensively excavated Hellenistic period urban site in Central Asia, Mairs explores how these ancient people lived, communicated, and understood themselves. 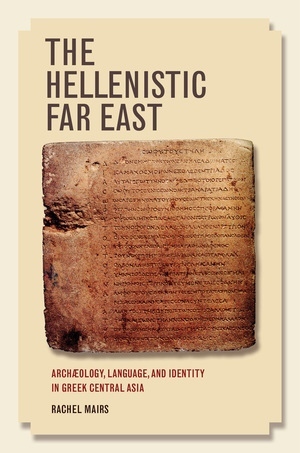 Significant and original, The Hellenistic Far East will highlight Bactrian studies as an important part of our understanding of the ancient world. Rachel Mairs is Lecturer in Classics at Reading University and the author of The Archaeology of the Hellenistic Far East: A Survey.